Alicia Keys has written an autobiography and it will be published by Oprah Winfrey's book imprint, An Oprah Book. The imprint from Flatiron Books - a division of Macmillan - was first announced in 2015. 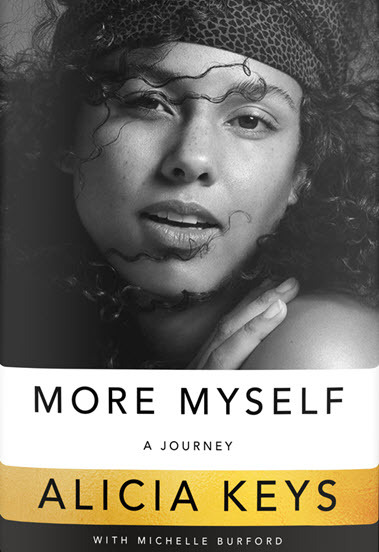 Alicia's book, More Myself, is described as part autobiography and part narrative documentary. Alicia wrote the book with Michelle Burford, a founding editor of O, The Oprah Magazine. Oprah also said this about Alicia's powerful presence in an introduction to her 2004 interview with Alicia Keys. More Myself is described by Flatiron as a "360-degree perspective on Alicia's path—from her girlhood in Hell's Kitchen and Harlem, to her career as a 15-time Grammy Award-winning artist, songwriter, and record producer, to the process of self-discovery she's still navigating." It will arrive in bookstore on November 5, 2019. The following video announcement with Alicia and Oprah was also released. Alicia posted the video on her YouTube channel. She says, "Thank you, Ms. O for the opportunity to share my truth as the first release of your new book imprint. Our journeys are beautifully woven together and our messages are similar: Now, more than ever, it’s time to continue to honor ourselves by walking more unrelentingly in our authenticity, no matter what!"